We are in the middle of a winter storm here in Devon, UK. It's cold and wet but brightening slightly. I tried very hard to get something decent to post and it was difficult. You can rely on the Robin to be with us always and the Blackbird is a common bird seen in almost every garden in every city and village in the UK. For my visitors from other continents, the Blackbird is a member of the "Thrush" family. The one pictured here is a male, females a a rich brown colour. In size it is much the same as an American Robin which is not surprising as they are the same family and share the same Latin name "Turdus". 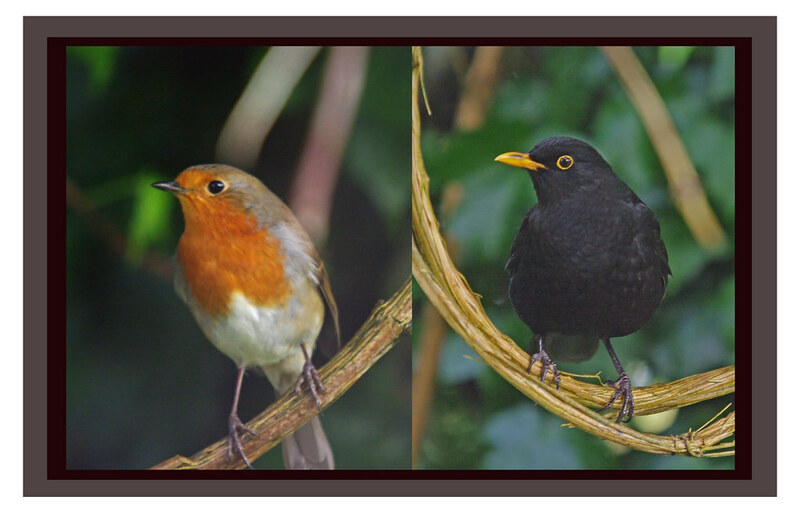 The other bird here is a European Robin and not related at all to either the Blackbird or American Robin. You may wonder as I do, why the early European settlers to the Americas failed to see the American Robin as a Thrush and decided because of the red breast to name it after the Robins they were familiar with back in their homeland.In my experience the American Robin fills the niche exactly in the USA that Blackbirds fill here in Europe.